TL:DR: I haven’t banned fidget spinners yet, and I don’t expect that I’ll have to do so. Spinners: Kids love them, teachers demonize them. They’re a distraction! 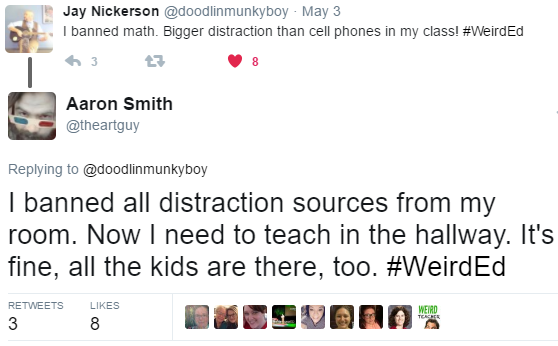 They’re disrupting the classroom! They’re fine for autistic kids, but to everyone else, they’re toys! I won’t have them in my classroom! We’ve banned them on the district level, and good riddance! Like any thing else that comes around and finds its way into a school setting overnight (remember the era before dabbing was a thing? ), we teachers seem to get polarized in less than half that time. And I really don’t mind seeing them in my computer lab. Look, I’ve banned all kinds of things in there. Food, drinks, gum, and lip gloss are forbidden items. I’ve had too many close calls (including one harrowing event involving a tube of petroleum jelly lip balm) for me to feel comfortable allowing them near the school equipment. But spinners? Really? Yes, you’re absolutely right. A fidget designed to help keep autistic children attentive does the exact opposite when placed in the hands of anyone not on the spectrum. OR, and this is just me thinking back to my own experiences, maybe sometimes accommodations for those who need them most can also benefit those who need them slightly less. In my youth, shortly after the invention of paper, it was a commonly held belief that doodling was a sign that a student was off task. My high school visual arts teacher encouraged us to doodle in our notebooks during other classes for purely selfish reasons (more drawing meant increased skill), and we readily agreed because one authority figure telling us to ignore another authority figure was more or less a teenager’s idea of heaven. It turns out that my old visual arts teacher was ahead of his time, and doodling in my more difficult classes may have helped more than it hurt. I won’t be so bold as to say that he saw this coming, but I do know that I’m more likely to remember details if I’m doing something with my hands. The list could go on if I really wanted to inflate my word count. All of these are things I have to deal with on a not uncommon basis, but they’re in decline among the students who bring spinners to class. Oddly enough, the spinners seem to be distracting students from other forms of distraction. My point here is that whatever the perceived distraction, it’s something that causes much smaller hassles than the other things a child will do when they feel the need to do SOMETHING other than sit perfectly still and stare at whichever wall we’re using with the projector. So far, I’ve taken exactly one spinner from a student. In his case it certainly was a distraction, and he didn’t get started on his project until after his spinner was in my back pocket. This same child has used his chair and desk as distractions before. The spinner wasn’t the lowest common denominator here. I won’t judge you. If you don’t like spinners, don’t allow them in your room. I don’t like when students sing off-key to the songs playing through their headphones, so I don’t allow that. Just don’t insist that it’s ruining your ability to provide instruction. Meanwhile, I’ll be over here making my ballpoint pen click over and over again. Not all of us prefer fidgets that spin.